Shortwave broadcasting paradox: better, cheaper radios and few broadcast signals. Let’s enjoy the ones that remain. Paradox is a state of affairs that combines contradictory features. 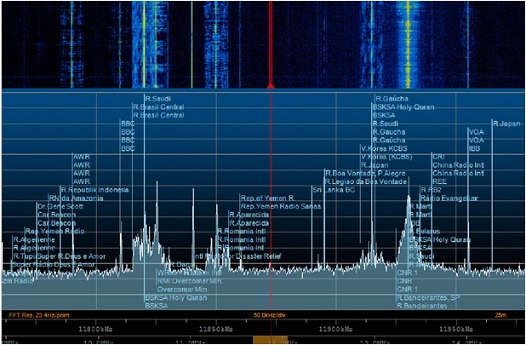 The shortwave broadcasting paradox? On one hand, we have more and more amazing receivers that are better and cheaper. On the other hand, shortwave broadcasting offers us less and less to enjoy. At lower price points, software defined receivers are amazing tools for shortwave listening. All contain great sensitivity and a bewildering variety of filters and signal enhancements. Plus, you get to look at entire swaths of spectrum and pick and choose. You can even record large chunks of signals for later analysis. Features like these were rare a decade ago. Now, they are common. Not only are the receivers value priced, the software is often open source or free for non-commercial use. Applications such as SDR-Console, HDSDR and SDR# provide pretty much everything you could ask for. On the other hand, at least here in North America, signals in the SWBC bands are increasingly sparse. Granted, part of this is due to the bottom end of the latest solar cycle. But in large measure, many popular broadcasters have just pulled the plug on broadcasts to North America. The good news is that we are seeing some increases in SWBC for a change. Recently, BBC World Service announced new shortwave services to the Horn of Africa, targeting younger listeners in Ethiopia and Eritrea, and their worldwide diaspora. Over the past two years, BBCWS has introduced 11 new broadcasting services, although not all are on shortwave. Included on-air services include medium and short wave broadcasts to the Korean peninsula. At the same time, of course, North Korea is ramping up jamming. More than half of BBC World Service listenership comes through radio. Its radio audience tops 154 million. Shortwave radio listenership is strongest in Africa and Asia. Its medium wave broadcasting is strongest in the Middle East. Many international broadcasters are going digital. BBC is following All India Radio in the adoption of DRM, which is also easy to receive and decode on software defined radios. China Radio International has ramped-up its English and other broadcasts to North America. And we can still hear a lot of Spanish and Portuguese broadcasts from South America and Cuba. Lastly, there are increasing numbers of low-power shortwave broadcasters in the Americas and Europe.